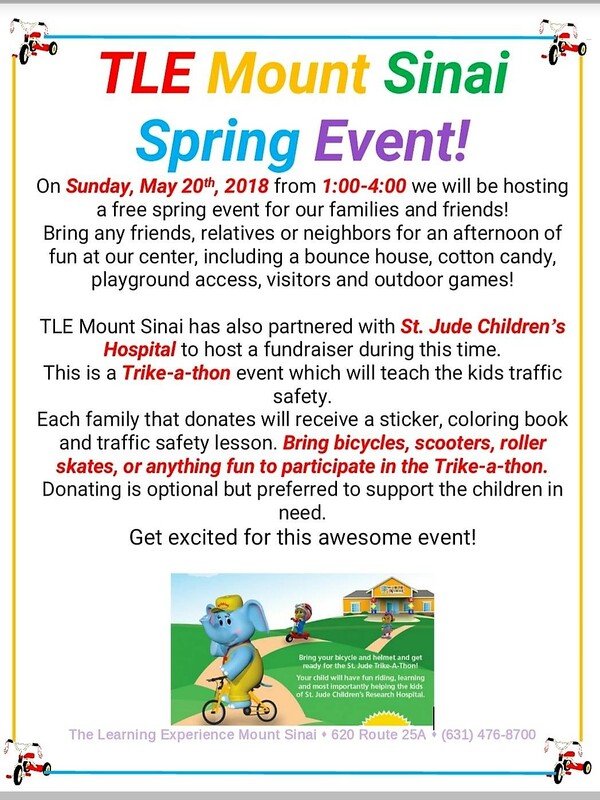 The Learning Experience of Mount Sinai is having a St. Jude children’s research hospital fundraiser this Sunday, May 20th, 2018. This event is open to the public and is an open house play day! Please feel free to stop by and/or bring anyone you would like. It will be a Trike-a-thon event so please being bicycles, scooters, roller skates or any ride on your child loves. Those families who provide a donation (in any amount they can afford) to St. Jude Children’s Hospital will receive a sticker, coloring book and a traffic safety lesson. There will also be a carnival themed setup for outdoor games and snacks, as well as raffle with fun prizes from our Mount Sinai community. It is definitely going to be a ton of fun for kids and parents. The event will be this Sunday, May 20th, 2018 from 1pm to 4pm. Learn! Play! Grow! Is the motto at The Learning Experience. Looking to contact the Learning Experience of Mt. Sinai? Your kids will have a fun and educational summer with The Learning Experience of Mt. Sinai! They are having 9 exciting thematic weeks which begin July 2nd, 2018 and ends August 31st, 2018. The Learning Experience of Mt. Sinai is currently accepting kids from ages 6 weeks to 5 years old. Registration is always open give them a call, (631) 476-8700 TODAY! WE HOPE YOU ATTEND AND ENJOY THE FUN!